BSJ | Do we really want a ‘UKIP of the left’? Following Douglas Carswell’s victory in the Clacton by-election (with an astonishing 59.7%), more serious questions are being raised about the legitimacy of UKIP’s threat to the three core parties in Britain. 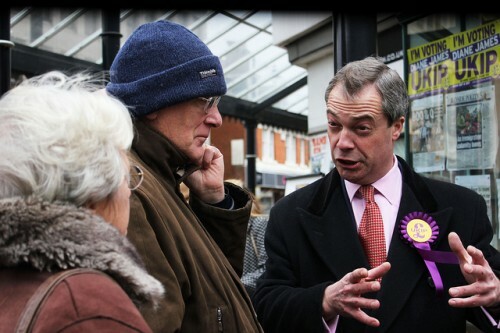 UKIP is incontrovertibly developing as an established figure in British politics with its mild successes in the May 2014 European elections and more recently, their first ever elected MP. With many right-leaning voters struggling to distinguish between Labour, Conservatives, and Liberal Democrats, UKIP is offering a viable alternative. So, as many writers have asked, why isn’t there the option of a ‘UKIP of the left?’ Personally, I wouldn’t vote for one. Before I explain my diffidence towards this concept, it is best to clarify what UKIP, to me, represent. Firstly and most obviously, they are, for many, a protest vote. UKIP have expertly capitalised on national socio-political disillusionment, and, corroborated by disproportionate media coverage, have provided physical scapegoats for the electorate; namely, the EU and immigrants. A vote for UKIP is a vote against Westminster’s myopic self-centrism. They are new, different and exciting. They are anti-establishment. According to one of the fathers on psychological telestudy Gogglebox, they ‘get’ the working class. They project themselves as the party to shake up Britain’s pedestrian political systems. Secondly, UKIP is a dynamic, libertarian right-wing party which appeals to people across the political spectrum because it subtly appeals to British nationalism, a concept which transcends political leanings. The party’s manifesto champions independence from the EU because the economic, legal and immigration policies allegedly undermine our own policies. The question as to whether UKIP has anything else substantial to offer other than a hypothetical referendum on EU membership has really yet to be publically asked, never mind answered. There have been vague whisperings of a flat tax rate, a 40% increase on defence spending, the scrapping of the ‘misconceived’ Human Rights Act, and halting ‘unjustified’ funding in renewable energies. However, there are frequent excerpts of their manifesto that I cannot comprehend. For instance, I cannot grasp their stance on international interventionism or on international relations generally. In power, they would be a completely unknown quantity. The only thing we definitely know about UKIP is its EU MacGuffin and that they are loud, polarising, and potentially very dangerous. A ‘UKIP of the Left’ would in all probability be just as loud, polarising and dangerous. Such a party would attract the borderline-extremists which analogously populate UKIP; there would be social democrats of course, particularly Labour and Green Party defectors, but there would also be Marxists, Trotskyites, and anarchists. There would be members happy to have their radical ideals gentrified, at least superficially, in order to exploit what would essentially amount to a leftist protest vote. In the same way UKIP have subliminally blended conservative policies with more extreme dogmas, this hypothetical party would flirt with aggressive egalitarian reform strategies; UKIP’s implications of laissez-faire capitalism could be paralleled with hints of Lange-Lerner neoclassical economics. It would be a fundamentally illogical manifesto, one defined by its inconsistencies and disunion. Furthermore, by its very nature as a protest it would be a fallacy rather than a legitimate party – a desperate, posturing tool of reaction. In the short term, however, there is little chance of a prototypical, perfectly executed social democracy party; one with a cohesive manifesto and a united front in intra-party politics. So what should be the alternative? The Greens are my personal choice but will realistically never challenge the primary duopoly of Labour and the Conservatives. The Respect Party looks promising on paper but will always divide opinion fronted by the reckless egomaniac George Galloway; furthermore, the party is ideologically incongruous in an international free-market context. Or, is it only truly viable for supporters of the left to vote for Labour and hope for the best? This seems to be the tactic Ed Miliband is relying on for the election next May. Perhaps I was a little hasty in criticising the idea of a left protest party after all.